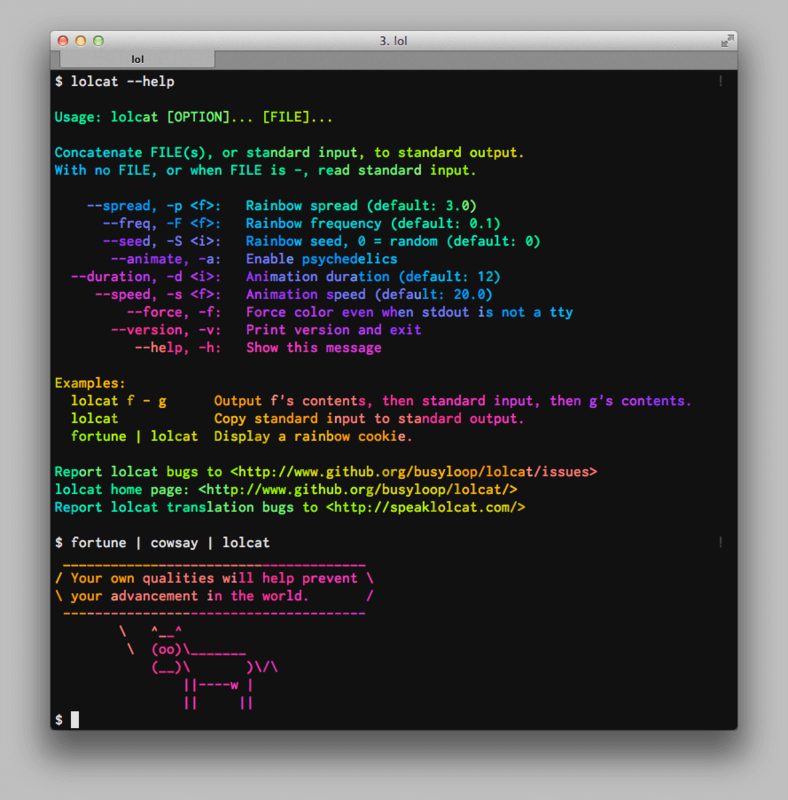 Day 64 was spent with a lot of git wrestling (it resists my friendship until the last moment!) and some refactoring. And now day 65 is actually the last day of the summer of code, and it still seems incredible how quickly three months have gone by! I'm a bit nostalgic now - the kanban board all cleaned (save for our logo), the box emptied (quite amazing - I didn't expect the stack of finished user stories to be quite so big! Yay! ), first good-byes said. was cut a little short because I wasn't feeling great after a flu shot and went home early. Before that, some reading up on CouchDB, and some thinking about what to do in my last four days (aaaaah! ), and a bit of progress on the current stories - I'm happy to realized that I now feel more comfortable messing around with things on the virtual machine so it feels less like this mysterious black box inside my laptop. Changed my rake task to prepare it for easier invite code deletion, then discovered that while it did what I wanted, it also broke 8 unit tests in the process. Sigh! So I changed it around until I had the best of both worlds. Also, a quick session with mentor Thorsten (Menthorsten? :D) on CouchDB, which was helpful - I don't find the online resources for CouchDB all that useful, I must say. My documentation was merged so posterity will know how to use invite codes, and I hope to get some more pull request feedback in the next few days while I'm still around. In general, I made some progress on several stories but at the same time, came up with more ideas for the backlog. It does feel a bit odd to be the only RGSoC person out here (or at least the only one still updating this thing). Five more days to go! So the pseudo-green tests are now a real, actual green (well, in spirit, they obviously look the same). So I learned how to run shell commands from within ruby and navigate around on the virtual machine from within the tests to make sure things are being set up correctly. Plus that signup loophole is now closed (or will be, once someone has time for the pull request). It's not always good when tests are green... in some cases, inexplicably green tests eventually lead to the discovery of a loophole that would theoretically allow people to create multiple accounts with just one invite code. So today was much about a) declaring computers illogical, b) digging around the code, c) realizing that maybe they are logical after all and there may be suboptimal code in the implementation of the invite codes. So while it felt good to finally discover the reason for the problems, it also means that the tests may not be as green as they first seemed. Oh well! OR ACTUALLY: To end the day, I updated the rake task to generate multi-use invite codes. ALL DONE! YAY! Hmmm, so am I going to keep updating this, as the one lone coding hamburger out there in an otherwise complete Summer of Code? We tried deploying our new invite code feature to a live system and... it actually works! So there are now some real live users trying it out. :) Yay! I also worked on the localization and recorded a video for Ada Lovelace Day that you can see here, along with many other great ones. Hm, how odd to update this with a regular update when I still have two weeks to go, while everyone around is announcing the end of their summer... (and calling mid-October in Hamburg "summer" does sound extremely optimistic). About 1000 cards moved on our kanban board after our monster pull request was finally merged. I entered a new German localization into Transifex - the old version was a bit unusual. Some tutorial time, and I went through some of the next steps for the last two weeks with coach Klaus. And it's also our last real RGSoC day because it was Aya's last day (well, lunch - I'm not actually sure when the last real day of our team was because of sick leave getting in the way, so it kind of went by unnoticed). It still seems weird just how fast three months passed! Other than that, a small bit of progress towards only setting up the invite code db for providers who actually choose to use invite codes. I also finished the German localization (now just have to find out whether to implement it directly or through transifex) and I read through a few chapters in a Ruby book. So a lot of today was spent pairing with mentor Thorsten to find our way through all the errors thrown at us by CouchDB and Vagrant and everything else we encountered on the way. But hey, I suppose it's for the greater good - at least if we iron out all the things that currently don't install or get set up correctly, future LEAP providers won't have to feel the same pain. :) And at least there was progress, so surely soon, it will all work smoothly (she told herself before seeing a new error message...). And for a nice feeling of accomplishment to end the day, I prepared the signup form to be localized because I noticed that it was missing the necessary labels, even on previously existing fields. We had a retro session in the morning, planned the team lunch and discussed the goals for Anke's remaining two weeks. (Anke) The end is near. Or actually, it may already have arrived unnoticed (how tragic): Our last real RGSoC day is already over and happened some time last week, because Aya is out sick for the rest of the week, has a day off on Monday and will then be at codetalks on Tuesday and Wednesday - and then it's already October. :-O We will still try and squeeze in a team lunch next week (those burgers by the Alster we'd been thinking about). 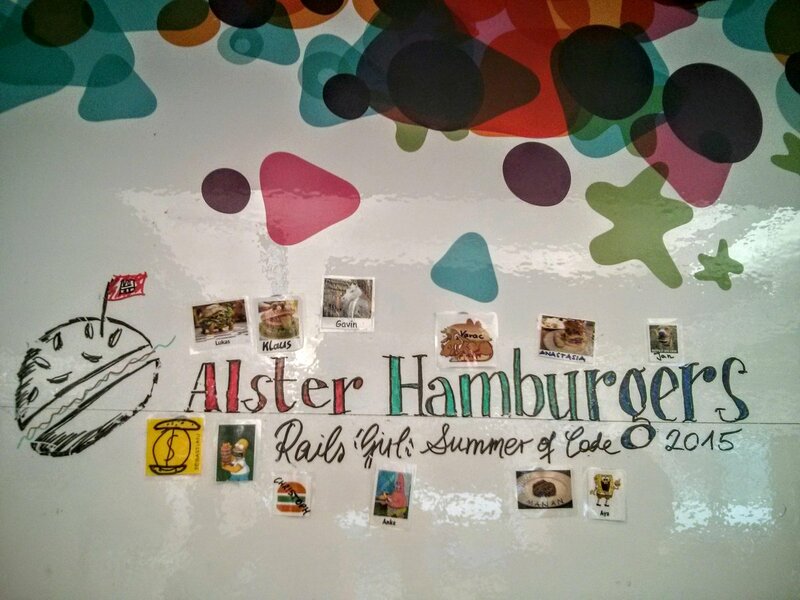 So for the rest of the summer, I suppose it will be just one Alster Hamburger. Today was once again all about trying to deploy our new feature to a virtual machine and proved more complicated than expected - again, some time spent with mentor Thorsten and coach Klaus to get it to work and we seem to be closer to it, once again, but not fully there. 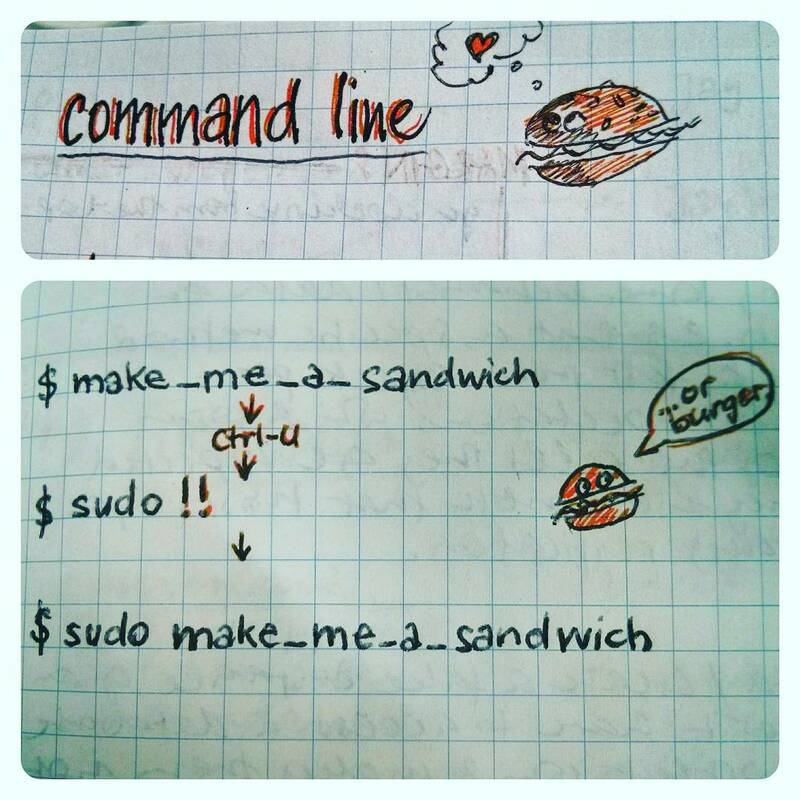 I also worked for a while on learning new command line tricks. Of course, there is always hackertyper.com if people doubt just how much you've learned during RGSoC, but in more productive ways, the command line always works in bringing up your perceived geek credibility... oh and it's also useful. ;) So I had a session on that today and learned some useful tricks. Today was all about Vagrant and trying to deploy our feature to a virtual machine. Also, some more reading on command line magic and duck typing and some of the LEAP documentation to prepare our own updates to it. The summer is over and viruses lurk to slow down our last full week. Aya is still sick, and so was one of our mentors, whose session on deploying our code to a virtual machine and test it there will be very useful. It's our last full week together but sadly, it starts with Aya out sick. Boo! I started with recreating the work Aya and I had done on Thursday, sat down with Klaus to find out what they found on Friday about updating our submodule, and then threw myself into battle with some rebellious capybaras and our last user story before The Big Pull Request. And, uhm, it looks like I may have won? Green tests, things appear to be doing what they should, but I remain a bit incredulous and keep waiting for another hairy creature to jump out at me... but for now, it seems our invite code feature can be toggled on or off as admins desire, and allows sign-ups both ways. 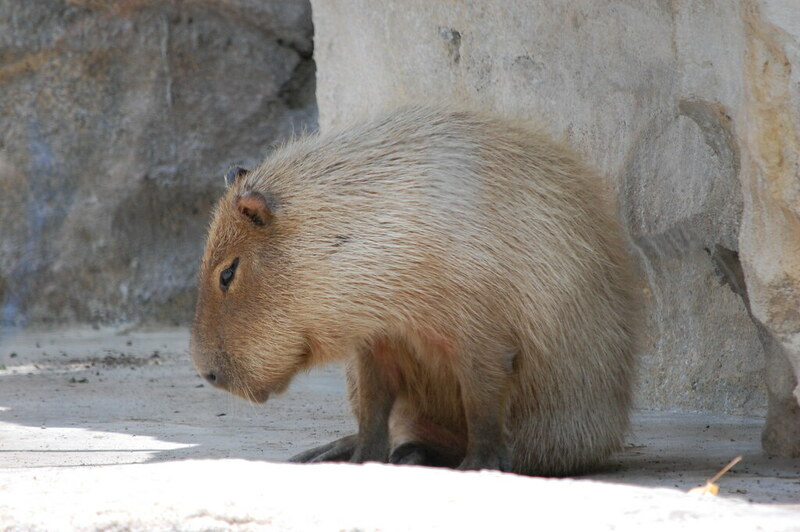 Sooooo after googling for a very long time, I asked our coach Klaus for some help with the capybara tests. He told me that it would be better to turn all the unit tests green first, before I specialize in those (much hated) fluffy creatures. So I did. Hopefully I haven't destroyed anything important along the way. Our blog post is live! We're the first RGSoC team to sum up our summer (even though we still have a bit of time to go). So strange to think that the time is almost over - those months really flew by and we're getting a bit nostalgic already. We've bravely thrown ourselves into the middle of that one last feature that is stopping our invite code functionality from being merge-able - with the help of some pointers and code snippet inspiration from Klaus, we've started to adjust some things to allow providers to turn our feature on or off as desired. While that already works okay (we believe), of course it now requires a lot of updates to existing tests to make sure that everything will a) work with the feature turned on or off and b) that both options will have sufficient test coverage. And c) everything should ideally be easy to maintain because it seems that both options will be permanent (because both have their fans among providers). Also, we're planned our wrap-up event, and some more sessions for next week. Day 45: The afternoon was the first day of the Polymer Summit in Amsterdam where we registered and then attended the Code Labs. Sadly, less progress than we hoped on learning more about Polymer (online code labs kind of depend on internet access... and only about half of the people present were able to connect). At least we got some nice offline toys to distract us. Day 46: Polymer Summit! We learned a lot of new things about web components in a day full of presentations on various aspects of Polymer. Day 47: Travelling back to Hamburg, and then picking up where we left off on Friday, i.e. right inside a Gordian git knot. (At least that's how it felt... so far there were only diverging branches. Maybe our stretch goal should be tying them into a proper bow? :D) But seriously: Everything is back to normal and work can soon resume on that one last feature. We also installed Vagrant and Virtual Box to prepare... and then we realized that we only have about one full week together left to work on the project. Where did time go?! Almost all of our coaches were at the office so we could have a proper retrospective and talk about upcoming events and plan some new sessions along the way. We also took a very funny teamphoto with a lot of unicorns ( + we tried very hard to make the missing team members fit into the picture - you'll see if the effort paid off in the upcoming blogpost). We also wanted to rebase and commit our changes but somehow that turned out to be a bit harder than expected, so we'll continue our work once we come back from the conference. Luckily we had pizza at our brownbag today (so that elevated our mood by 100 %). We've also finished our blogpost and are working on a mini showcase so stay tuned! After we had our daily with our coaches, we spent the day working on the feedback Azul gave us on our pull request. We tried incorporating his ideas as best as we could and (with some help from our beloved coach Anastasia) made some changes to the code. Hopefully it all works now! After the git tutorial we had our Hamburg Gem Sessions meetup, where we decided what kind of project we want to work on for the next couple of months and experimented with a beacon from Google. Hmmm... we were a bit stuck today, actually. We solved our git issue with the help of Klaus - or so we thought, and so all of our local machines thought, except Travis disagrees. So we now have a cleaner-looking pull request but an unhappy Travis, and aren't sure why. Boo. We're also still a bit uninspired about our next user story and how to really make it happen. 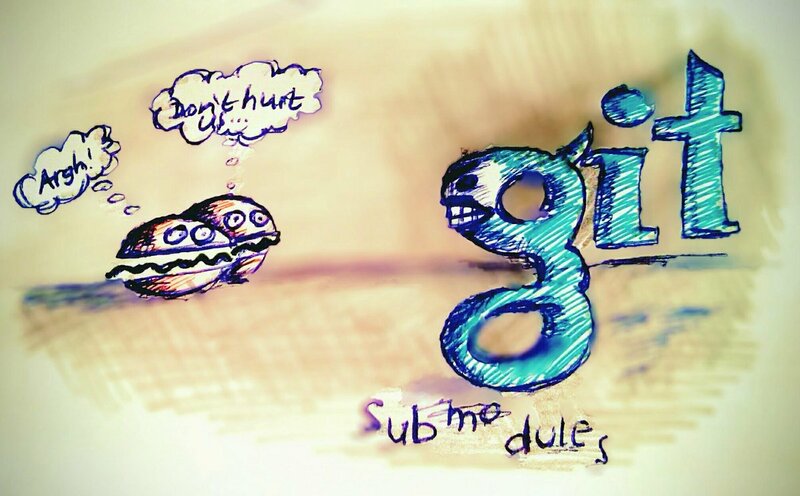 So instead, we went back to basics for a bit and did some git tutorials to hopefully get over our growing dislike of it (we just want to be frieeeends). Plus we finished the first draft of our second blog post, and will attend a talk on privacy and encryption at ThoughtWorks this evening. We're so excited and proud about today!!! We have just sent all of our work to the leap web maintainers. You can see what we've done here and are eagerly awaiting their feedback! Well it was rather a kind request to review our work rather than a serious request to merge our work but it's a big step for us! We also tried to split our already submitted pull request but it appears to be very difficult to rebase our work and change the history with git. After we had spent a few hours with our coach trying to solve our little problem, we decided to leave things as they are and just remember to keep our pull requests smaller in the future! Lessons learned! We had a very interesting townhall in our office, too. Daily meeting to plan the time ahead (which included noticing that TIME FLIES and we actually don't have all that much time left :-O ). We planned next week's trip to the Polymer summit in Amsterdam (yay) and found and booked hotels and flights. We sat down with Klaus to discuss feature toggles and whether they will be the right solution for our next story (yes... and no), and in the afternoon explored git a bit more to prepare our pull request and understand rebase/merge/fetch/pull better. After lunch, we had a session on the role of a QA in agile software development, then did some actual QA-ing with coach Jan (no new bugs, hooray), and then learned about software design patterns with coach Manan (YAGNI, KISS, SOLID, ... yay for abbreviations!). 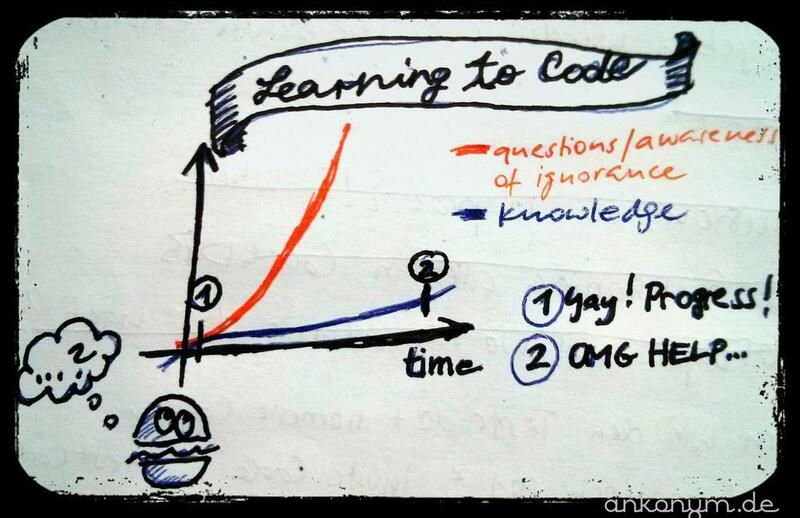 So: Lots of new knowledge and travel plans, and hopefully, one step closer to the pull request. We started our day with a standup with some of our coaches and after that we worked on a very important bug, which we fixed! Hoorraaaaaay! After killing the bug we did some more research on feature flags. They sound pretty awesome in theory but we're not sure how to implement them in our code yet but we'll keep you posted! We also had some fun today at the Brown Bag session at the office today where we learned a thing or two about the new programming language Rust. Early start: A session with Anastasia on algorithms and data structures (well, a quick intro, but it was helpful in letting us know what else to learn :) ). So it took some time to get everything working again on Aya's computer. 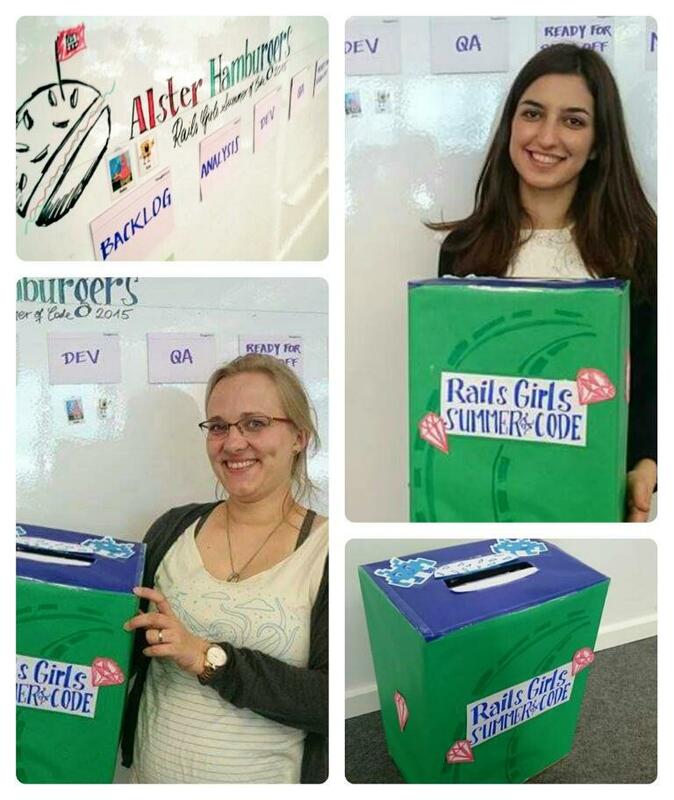 Tonight, we'll present the Rails Girls Summer of Code at the Hamburg Geekettes Dine & Discuss event, plus Aya will show her drone skills. So she practiced them a little bit at the office, flipping the drone and generally impressing colleagues :). Our build on Travis is green! Such a short sentence, and still it sums up pretty much our entire day. Getting it from about 40 failing tests and test errors to this involved lots (LOTS) of digging around the code, dealing with Capybara and Cucumber, and getting our shiny new invite codes to play nicely with all the existing tests. Also, we fed our Kanban board with a lot of stories for the backlog - now that we made Travis happy, we can focus on breaking stuff again - I mean, our next features. Anke: More pairing with our visiting mentor Azul to fix some more of the failing tests on Travis. Lots of things are back to normal but integration tests are still unhappy (sigh). I read some more about Factory Girl, and we discussed the best way to set up tests in the future to stub out our new feature for all unrelated tests. We also discussed our strategy for upcoming features that we'll work on - one big one that will complete our main invite code functionality so it's worthy of a pull request (yay! ), as well as some smaller features that will make it nicer to use but aren't highest priority. So once Travis is happy again, we have some more exciting things ahead! Oh, and I was able to help someone at the office with HTML/CSS questions. After feeling quite confused with some of our tests, it felt good to be able to actually also have some answers rather than just more questions! ;) The day ended with a coaching session with Klaus on Enumerables. Productive day: We have another mentor visiting the office for two days who is very familiar with the web app that we work on, so pairing with him has been very helpful. Especially after we had a (slightly overdue) QA session over lunch, which resulted in a few bugs and mysterious issues. The mystery issue (which, in the end, turned out to be a method being called twice) was fixed during an afternoon pairing session, the main bug is still waiting... and will probably wait a bit more while we dig deeper into our test setup. We have some test design questions to solve before Travis will be friends with us again, and at the moment, it seems a bit like any new feature we build, even when manual tests make it look like it works as planned, always results in a few dozen failing tests that take longer to fix than the feature took to build. Usually tests not directly related to our feature. Hmmm... So many moving parts, but I feel like there has to be a better solution. I hope. Coach and mentor Klaus and Thorsten had another look at why Travis kept insisting that there were some errors in our tests that we didn't see locally, and found some issues that were causing the failing tests. It seems that the cause is similar to the problems we ran into the day before, so we need a bigger change of plan to make things work. So back to the drawing board... and actual pen and paper to draft new ideas. We put together a new sign up flow that validates things correctly and will get rid of the problems we've encountered. We were quite blocked on how to start building our new solution, so had a look at a few tutorials to re-inspire ourselves (and get a little break to return to the code with a fresh mind). 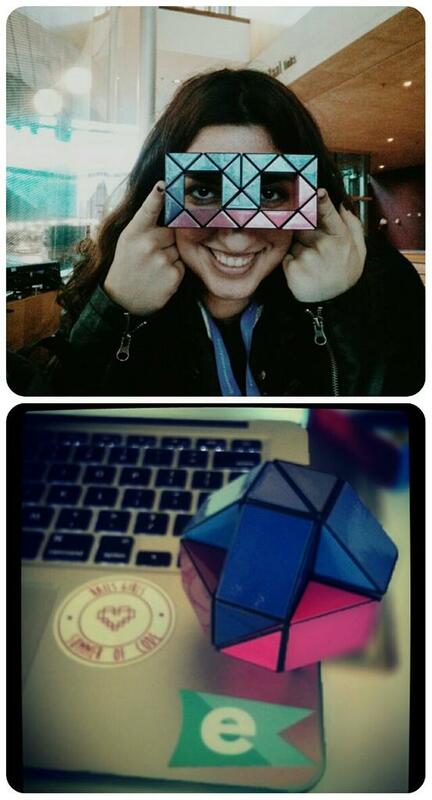 In the afternoon, we had a session with Anastasia to try and start implementing our new flow. It still seems a bit tricky to get it all to work together smoothly with the submodule that handles the sign-up form, but we made first steps towards a solution. And the night marked the very first meeting of the Hamburg Gem Sessions! After seeing the many great study groups from Berlin at Eurucamp, several people from Hamburg decided we should start something similar in Hamburg (that will also continue post-RGSoC), and had a first meeting with two coaches and four learners to get things started (and decide on a name). The RGSoC day off! 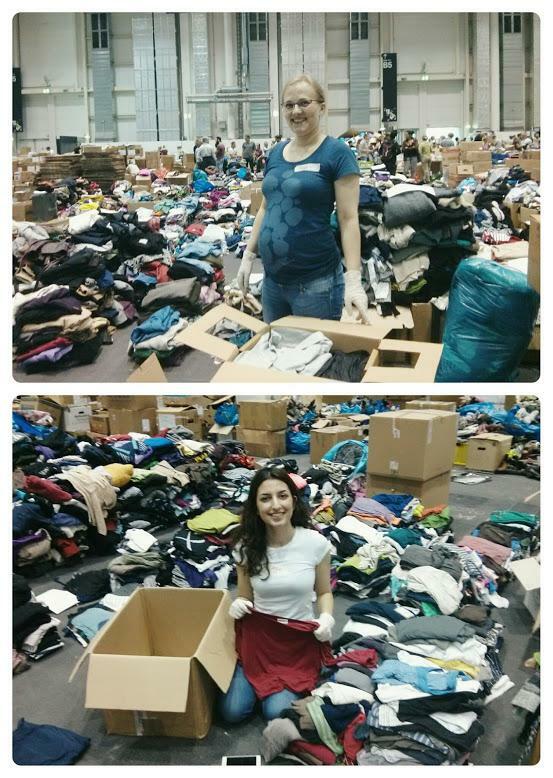 We decided to put our afternoon to good use and went to volunteer at Hamburger Messehallen - a big convention center that is currently both the home for 1,200 refugees who recently arrived in Germany, and houses the gigantic donation center where volunteers collect, sort and box up everything that friendly Hamburg residents bring over. We talked to some people who had been there a few days ago to help already, and they say it is absolutely amazing how many things have been donated just in the last few days. Our photo gives an idea of the proportions of the donations - behind us, you only see women's blouses, shirts and shorts! So we helped to sort and box up blouses for a few hours. In general, pairing worked quite well, however. :) We have an idea on how to continue tomorrow and hopefully it will all magically sort itself out... we do seem to be halfway towards solving our last two user stories that still stand between us and our first pull request (because we were waiting to have a complete set of features around invite codes done before sending it). At some point, Aya gave in to the jetlag and I joined a team meeting of the ThoughtWorks Quality Analysis team to find out more about how they work, and their role in the agile software development process. We're finally reunited <3 I'm back from Seattle and Anke is feeling better! After that Klaus and Christoph were working on our failing 33 tests on Travis that all pass locally. (Why, Travis, why?!) We'll look more into that I guess. It was a really good day for us, because we signed off two stories today. The cool thing is that we didn't even need that much help from our coaches! Batch-generating invite-codes is working now AND the user can type in how many invite codes should be generated. Isn't that just wonderful news? I guess mastering rake helped us a great deal today and we're really happy that we stuck with it. Even though it sometimes felt like this. We're off to the train station now after lunch for the Open Tech School conference in Dortmund, so it was a short day. And now, Dortmund, here we come! But! As a result, two more stories moved across our Kanban board to the QA lane, two more are already ready for sign-off, and all together, they mean our first real pull request may be getting much closer! (So far, our finished tasks seemed to small to ask to merge them but slowly, it is getting a bit more substantial). We started our day with a session with Klaus where we made a class which inherits from CouchRest::Model::Base (for more info go to this page). It was a very informative session where we discussed our next steps and it felt like some kind of a second kick-off for our little project because we were kind of lost. Now we're trying to figure out what exactly should go into our class and how to implement everything. Our coach Thorsten is back, so we briefed him on our latest progress with the leap code. We also had the second part of our Retro today. We also found a helpful codecademy course on Ruby on Rails Authentication. Let's see if we ca learn anything useful four our class! We started our day with a short retro and a showcase. We were really happy and proud to be able to show our progress - the first two stories are officially ready for sign-off. This means that we have added a text-field for our token and we get an error message if the invite code/token is wrong or the field is left blank. Yay! We weren't able to finish the retro (because Aya had an important meeting), but we decided we'd continue our retro on Monday to talk about the things we want to concentrate on. After that we had an interesting brown bag on the Internet of Things and Uber. Today we worked on some git issues and learned a lot about branches with Klaus! We're kind of stuck on the next story but we're sure we'll know what to do by Monday when talk to our coaches again. Much of the day went to intense git wrestling: It turned out that our newly integrated signup form field needed changes to a 3rd party library, which a) doesn't seem ideal and b) makes life quite hard when trying to push your changes to git. So together with the help of several coaches, we first made the submodule into part of our code... and then back into a submodule after changing our minds. It certainly taught us a lot about git beyond the basic pull-commit-push-merge we'd needed so far, and went along with a longer coaching session on git as well. We ended the day with another coaching session on password cryptography (to understand some of the cool aspects of LEAP as well as what exactly that 3rd party library does that took up so much of our day). So now we have a better idea of hashing and salting. Starting out with the bad aspects of the day: Aya is ill and stayed home to recover. :( Hopefully she will feel better soon! And Anke had to go home to work from the couch with her legs up for half of the day (the joys of working on the "side project" of the next generation of coders in hot weather). To get through the post-lunch slump, we worked more on kanban decorations: Now we also have a box that will hold all our completed items from the kanban board (and it will be opened at the end of the Summer of Code to look back on our progress). We're all set for the upcoming conferences! And started thinking of our lightning talks. We also booked our spots for some cool Eurucamp activities on rubyweek.org. Yay! Aaaaand: LEAP project planning! This took up much of the day. First, we looked through our exercise results from last Friday and split it into separate issues and flows. Then, we had a great session with coach Manan to start writing user stories and estimate the work for the next days/weeks/(depending on how good our estimates were :) ). The day started out early again: We had another 8am Ruby session with coach Anastasia to go through some of the questions we had from working through our tutorial (in which we're slowly approaching the end!). She shed some more light on classes, modules and structs, which was helpful. There were a few more useful meetings: Our weekly catch-up with our supervisor Adam and our daily standup, in which we made some plans on how to put together a good roadmap over the next days and have a few more study sessions with our coaches, to make sure our summer of code ends up productive. (Anke:) I also attended a ThoughtWork team's retrospective meeting to get ideas on how to run ours in the future. My main takeaways: It was very clearly structured and made sure to collect input from the entire group about what went well and what could be improved, and condense it all into action items. There was also a lesson learned yesterday evening: GitHub is very forgiving about markdown errors but the Rails Girls SoC blog will expose them without mercy. So even though we had triple-checked our submission, we had to quickly correct our links when our first blog post when online. Hey, some git practice is always good! 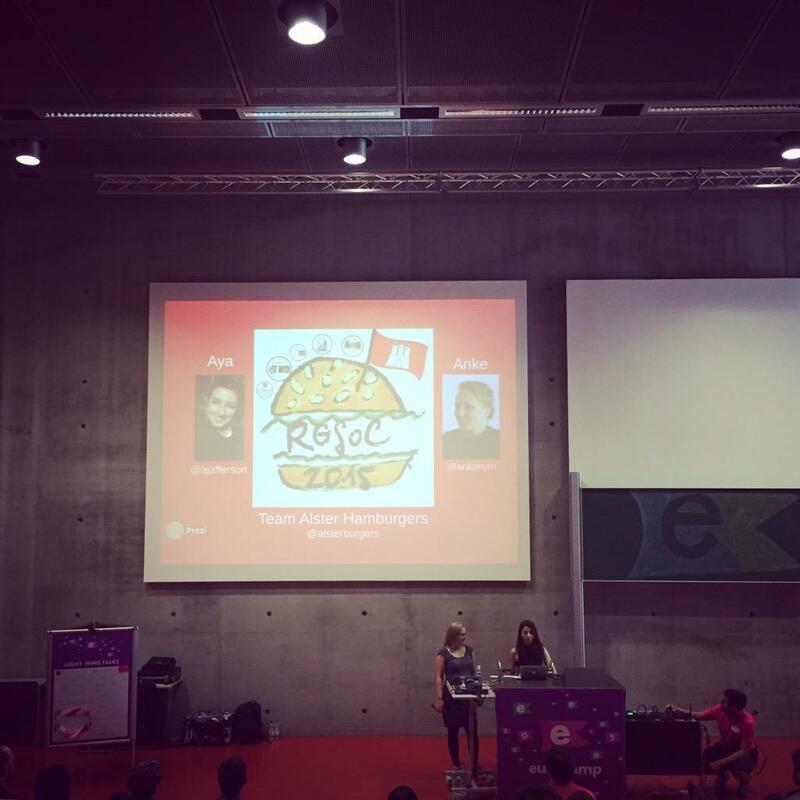 :) And it was great to make our official team introduction on the blog. (Anke:) I tinkered with my Rails installation because after setting up something else, the LEAP web app would no longer start. It's working now, and I also learned that the browser cache can do odd things with storing one app's CSS file and then applying it to the next app you open, making it look... odd. Busy day (or maybe just a wordy one?). We also entered the conference ticket raffle and are now finding it very hard to type while keeping all available fingers crossed so that we may end up in Dortmund or Potsdam soon... and we have mysterious Twitter issues: We can no longer post tweets without any obvious error messages. Which may be why all our communicative energy went into the daily log today. We started our day with some tutorial videos and a meeting with our mentors where we briefly explained to them what we have learned so far and how well we liked the course. After the meeting we resumed watching some tutorial videos while also experimenting a little bit with GitHub because we had to figure out how to publish our blogpost. Then we had another meeting with our mentors where we reviewed our week so far and made some notes on what worked well and how to improve the things we didn't like. After the meeting we were working on uploading the blogpost to GitHub, which took us longer than we thought but we're extremely happy that we managed to pull our first request ever! We ended our day with some exercises and unit tests. We had a long audio conference with the Leap web app developers yesterday evening and it was really helpful. We chose our first project, and today discussed more with our mentors what our first steps will be to implement token-based user registration for the email web app. We also continued our ruby tutorial - already half-way through! Yay! Yay! We're excited for day 2!